What Is DD Form 1750? DD Form 1750 or the Army Packing List is a form used by the Department of Defense (DoD) as a packing list used for keeping track of certain items within the U.S. Army. In particular, it's used for all shipments and freighting of equipment and materials to and from military installations. The latest edition of the form was issued in September 1970. A fillable version of the DD Form 1750 is available for download below or can be found on the Executive Services Directorate website. The information required for the army packing list - often incorrectly referred to as DA Form 1750 - includes the number of containers and their contents as well as the date and number of the order. How To Fill Out Dd Form 1750? listing. For the purpose of clarification, explanations of the various entries on this Packing List are furnished. ITEM 1. The number of boxes in a set. part number shall be used. in any correspondence regarding this shipment. requisitioned through normal supply channels. information cited above (See 5.3.1.1). for operation of the equipment. ITEM 4. Date of preparation. The packing list can have multiple data entries depending on the number of goods that needs to be listed. Assign a page number to each individual copy of the DD 1750 and list the total amount of pages in the space provided to ensure that the pages are in the correct order. An overview of all six boxes of the packing list can be found on the second page of the form. Start with entering basic freight information on top of the form. Enter the name of the packing person or group and the number of boxes in the container. If the freight shipment has a requisition or order number provide them in Boxes 2a or 2b. Box 3 is used for the identifying the stock number, nomenclature and type number of the end item if the package consists of parts that will be assembled into a bigger piece of equipment. Leave this box empty if the package consists of supplies or basic parts that are not intended to be assembled into an end item. Leave Boxes 4 and 5 blank until you have described all equipment and parts being shipped. After filling in all necessary information about the shipment, start listing all of its parts in Columns A and B. Describe the unit of issue and required quantities in Columns C, D, E, and F. Use copies of the DD 1750 as continuation sheets if you run out of space. 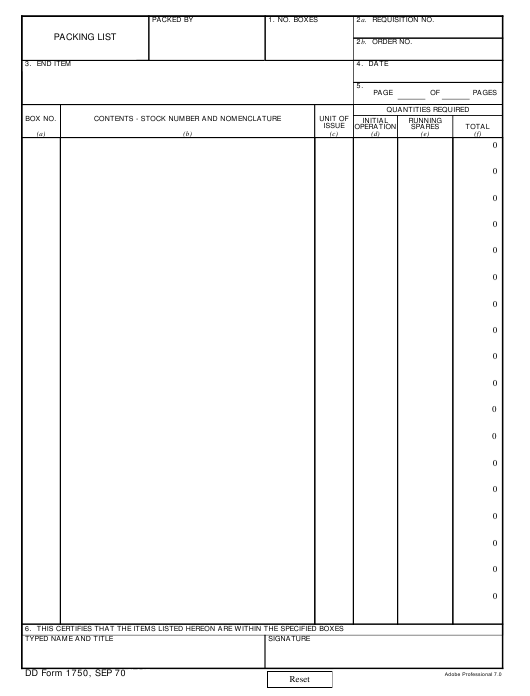 Once the entire shipment is accounted for, the supervising official must certify the form by signing and dating it at the bottom of each page. Enter the date of filing and the number of pages attached to the shipment in Boxes 4 and 5 respectively. Remember to make two copies of all forms, since one set will be sent along with the shipment and the other retained for reference.